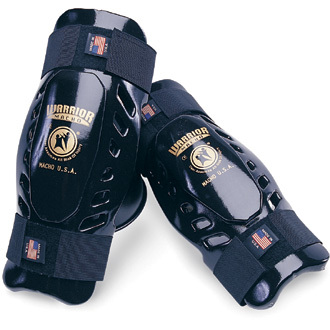 Macho® Warrior Shin Guard Warrior protective gear features thick shock-absorbing vinyl covered foam with a double layer of coverage over high impact areas. Cool metallic blue color with silver logos and designs will make you the envy of your competitors. Has hook and loop closures for a secure fit plus are well ventilated for added comfort.